Eddie Krutysza started with Notcutts in 1969 and trained to be a horticulturist. In 1979 he left Notcutts as it was becoming a huge establishment, which made it more like a factory than an old style plant nursery. Eddie aspired to have his own nursery, where he could propagate, grow on and nurture his plants. 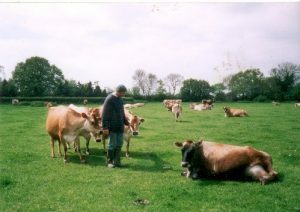 Slowly, between milking the Jersey cow herd and farming the land at Hattens Farm, he built the nursery. First with roses then fruit trees and now there is an array of trees, both native and ornamental along with soft fruit and shrubs. Luckily he has a huge fan base of customers who return year after year and pass on his name to friends and neighbours who come along too. Eddie believes that advice is free and enjoys sharing his expertise with his customers which many have become friends! In 2011, Eddie took his 5 acre nursery patch as part of his inheritance from the farm and moved out of the Farm House at Hattens Farm into a mobile home on the nursery patch. His intention was to leave the farming behind and concentrate on his life long love, growing plants in his nursery. In the past Hattens Farm Nurseries was mainly a bare root nursery with just a few containerised shrubs. The season run from October till April each year lifting and supplying bare root plants. In this season he worked closely with Tony Horn who imported plants from Holland. In 2012, sadly Tony died and he left the importing business to Eddie. This was the first season that the nursery has imported hedging personally, which allows the nursery to be very competitive with prices. 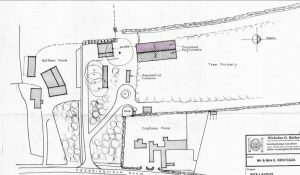 Since 2011 the nursery has received planning permission for an independent driveway from the farm, an agricultural building with a 45’ x 12’ glass propagation house and two polytunnels with the floor space of 54’ x 120’. This will allow the Nursery to expand into an all year nursery rather than a seasonal nursery. The agricultural building will allow a much needed dry space for storage and potting. The propagation House will allow Eddie to propagate plants which require a specific environment to grow. The polytunnel will allow the new plants to grow on and “over winter” tender plants. It will also allow an area to display the plants in a dry environment. Hattens Farm Nurseries will remain “An Old Fashioned Nursery” where customers can come in the summer months and see the plants at their best, pick out the ones they want and return in the bare root season to collect their ordered plant. But to fill demand for our new customers who require plants whatever the time of the year, more of the plants will be containerised. Hattens Farm Nurseries has a great future ahead, please come and visit and enjoy the trip to the future with us.